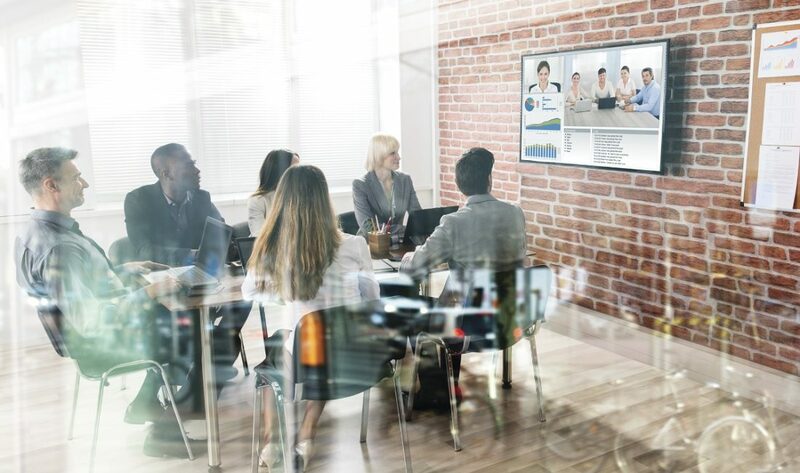 As video conferencing market customers adjust room usage & applications widen, integrators see a bright future for video collaboration solutions. 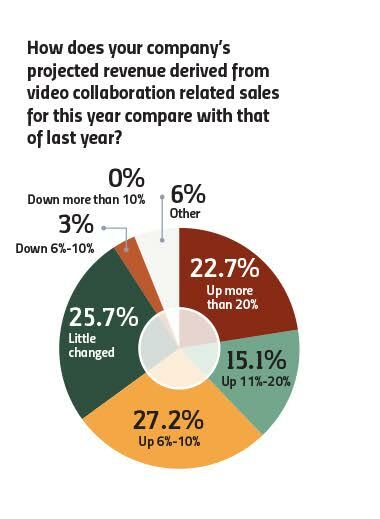 What all agree on, though, is that video collaboration is an AV market sector with considerable growth ahead of it. According to a market report published in April by Transparency Market Research, the global video conferencing market was valued at just over $5 billion in 2016 and is expected to expand at a CAGR of 7.9 percent from 2018 to 2026, to reach $10.5 billion by the end of the forecast period. “This is due to an increasing trend among organizations to ensure the availability of video conferencing services without the need to employ and maintain a permanent in-house technical team for the purpose,” the report states, noting that growth will be the strongest in corporate, healthcare and government/defense sectors. Growth will be the strongest in corporate, healthcare and government/defense sectors. According to the report, the “conventional” end of the video conferencing market is expected to expand at a steady CAGR over the forecast period from 2018 to 2026, with the cost of hardware, including high definition (HD) displays, cameras, microphones and dedicated video conferencing networks driving those numbers. However, the software segment, which includes apps and SaaS (software as a service), is also likely to expand at a significant rate during the forecast period, driven by rising demand for cloud-based video conferencing solutions and related services globally. Another survey, by strategic market-research firm Futuresource Consulting, also predicts growth. “Based on our findings, 32 percent of respondents from Futuresource’s latest Corporate End User Study report an increase in the average amount of time spent meeting remotely via conferencing technology on a weekly basis,” Futuresource research analyst Anthony Brennan tells Commercial Integrator. Integrators are finding video collaboration to be a fertile field, comments George Maniatis, account manager at Mountainside, N.J.-headquartered Verrex, but one where the most important collaboration has to take place before any displays are put in place. “There’s a very wide range of possible solutions out there and choosing among them can be challenging,” he says, ranging from hardware-centric collaboration solutions from traditional vendors like Polycom and Cisco to software-based ones like Skype and GoToMeeting to apps on smartphones such as Zoom. Corporate and healthcare verticals are the ones he’s seen the most activity in around the video conferencing market, with systems security a major factor in both but especially in the latter, where merger and acquisition activity is roiling the video conferencing market but where HIPAA and other regulatory considerations demand a high level of security. Maniatis says he’s also seen considerable uptick in demand for video collaboration in the higher-education vertical. That’s also driven by external dynamics; in this case, distance learning across sprawling urban campuses and between cities, states and regions is bringing classes to more students through online portals, and these are increasingly using software-based codecs to essentially utilize video collaboration as a teaching platform bridging distant students and classroom-bound instructors. They also want archiving and retrieval capability built into their collaboration platforms, to let remote students access classroom materials later. On the corporate side, Maniatis is finding that while conventional hardware-based solutions remain desirable at the enterprise level, more collaboration is taking place at the huddle-room level, and those spaces often have to be available on short notice to smaller groups of users. As a result, those types of spaces are leaning toward software-and app-based collaboration solutions like Skype for Business and Zoom. “That’s also being driven by real-estate costs, which are causing corporate users to scale down their collaboration spaces but without losing any functionality, like being able to mark up documents on the fly and real-time annotation,” he adds. These are also being applied to employees working outside of the main offices, either at home or traveling workers such as sales personnel. The idea that video collaboration transcends verticals was further advanced by Stephen Jenkins, senior director of intelligent technology solutions at Kenilworth, N.J.-based integrator Diversified. “Video is everywhere now, starting with apps like FaceTime, so it’s come to be expected everywhere, including in collaboration,” says Jenkins, whose background, like a growing number of AV professionals, is in IT. “What’s changing is that video collaboration is being extended throughout the companies and organizations that use it, to interact with functions like calendaring and directory services. The enterprise level remains constant; the growth, he contends, is coming from smaller companies that are using video collaboration not only for meetings but for more quotidian purposes, as well. He cites a mattress manufacturer that is using smartphone-based collaboration to connect delivery personnel in the field with more experienced employees when deliveries encounter problems. “There might be an issue getting a really big mattress upstairs, and someone back at the office and can look at the situation and make suggestions,” Myers explains, adding that those same users can also document the process, noting, for instance, any damage to a location that existed before the delivery, thus potentially limiting the users’ liability. The biggest challenge is finding systems that can scale from the enterprise level to the smartphone. “Research shows that today’s employees can spend up to 80 percent of their workdays collaborating,” says Hannah Grap, VP of marketing at Prysm. 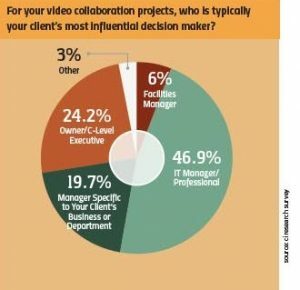 “Because of this, we are seeing demand across almost every vertical video conferencing market — from pharma to financial services to manufacturing — for enterprises looking to build or update customer experience centers and premium conference rooms with new video collaboration solutions that encourage a better employee collaboration experience. Like much else in technology, what originates at the upper end of the market will eventually make its way into broader applications, as costs decline and software is more widely used. And that, says Thorson, is what integrators need to focus on in the future. “The Fortune 500 companies get it and they already have it; the new real opportunities are as this moves downmarket,” he says. He recommends focusing on SMBs across all applicable verticals — something he says Polycom is already doing via partnerships with other systems developers in those video conferencing market strata — and not seeing just the verticals but the ecosystems within them, such as HR and engineering. It was no surprise that at InfoComm 2018, visual collaboration solutions were omnipresent on the trade show floor, with manufacturers unveiling hardware and software aimed at helping integrators solve their customers’ emerging collaboration needs. For manufacturers and integration firms alike, collaboration has quickly developed at a profitable product category. Consider that, according to CI’s Trends in Collaboration survey of 66 integrators, a whopping 65 percent expect their revenue from selling video collaboration solutions to be up in 2018 versus that of 2017. Nearly a quarter go so far as to project revenue growth from collaboration at more than 20 percent. Only 3 percent expect their collaboration revenue to stall or drop in 2018. It’s becoming less simple to take a snapshot of a typical collaboration customer, as our Trends in Collaboration survey of 66 integrators attests. To a certain degree, pretty much every vertical video conferencing market other than bars and restaurants has a need for collaboration. Large businesses appear to be most likely to invest in collaboration solutions. A whopping 83 percent of surveyed integrators say that their large business (over 250 employees) customers are “very likely” to purchase collaboration solutions. However, consider that medium-sized businesses are overwhelmingly either “somewhat likely” or “very likely” to purchase collaboration. In fact, only 2 percent of our respondents say that a medium-sized business isn’t likely to purchase collaboration. The smaller the business, however, the less likely they are to purchase collaboration, according to our survey. Corporate businesses with less than 50 employees are “not likely” to purchase collaboration, according to 34 percent of our respondents. There are also more functional and environmental motivational factors. If a company uses huddle spaces they’re great candidates to buy collaboration solutions, according to 61 percent of the survey. If they have remote employees, they’re likely to invest in collaboration, according to 77 percent of respondents. 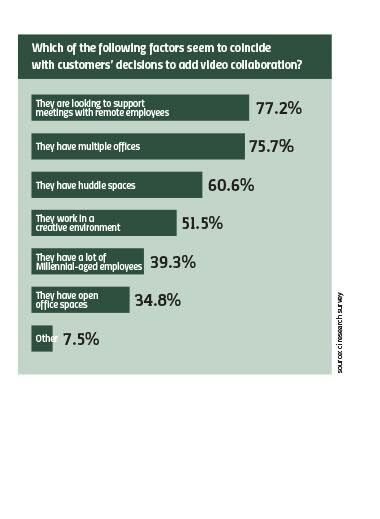 If they have multiple offices, they’re good collaboration candidates, according to 76 percent of those surveyed. 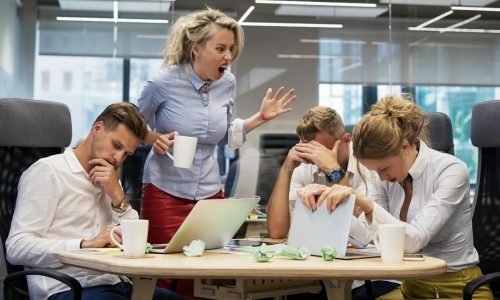 Other factors such as having open office spaces and boasting a lot of Millennial-aged employees can also be influential. CI’s annual State of the Industry Report has shown a year-over-year shift toward IT department decision makers and not old-school facilities managers pulling the trigger on tech purchases. This is very much on display in the video conferencing market, according to the 66 integrators taking our Trends in Collaboration survey. A nice round 50 percent say an IT manager or professional is the typical decision maker. 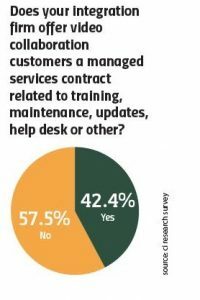 Only 6 percent say facilities manager.